Three years after being shot by a Border Guard officer during an anti-security fence rally in the West Bank village of Bil'in, Limor Goldstein was awarded damages in the amount of NIS 3.25 million (about $860,000). The case dates back to August 2006: Goldstein, an attorney, was taking part in a rally in the Ramallah adjacent village. A riot broke out, and while security forces were trying to control the scene, a Border Guard officer fired three rounds of rubber-coated bullets in Goldstein's direction. One of the bullets hit him, causing a severe head injury. According to his statement of claim, the officers on the scene refused to call for medical assistance, despite his grave injuries. The entire incident was captured on video (view discretion is advised). Goldstein's injuries resulted in brain damage and he sued the State, as was awarded damages as part of a State settlement, validated by the court. 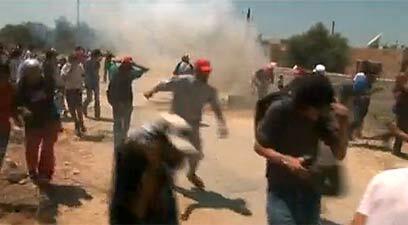 "It was a non-violent rally, and the Border Guard officers were the ones to use violence by firing rubber bullets," Attorney Bishara Jabali, representing Goldstein, told Ynet. "The fact that the State agreed to pay damages without admitting liability proves that the security forces' actions were inappropriate." Goldstein, added Jabali, frequented Friday protest rallies in Bil'in as a way to exercise his democratic right. "He paid a very high price for it… the footage showed exactly how security forces treat the protestors." Martin Fox, the officer who fired at Goldstein, was charged with aggravated assault shortly after the incident. A subsequent petition asked the High Court to order the police to hold an inquiry into the conduct of the force's commander as well. Goldstein said that the case in not finished and that he is still waiting for the criminal proceedings against Fox to end, as well as for the High Court decision in the case. See all talkbacks "Protestor shot by Border Guard officer in Bil'in awarded damages "